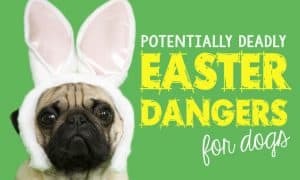 What would make Easter even more special than it already is? 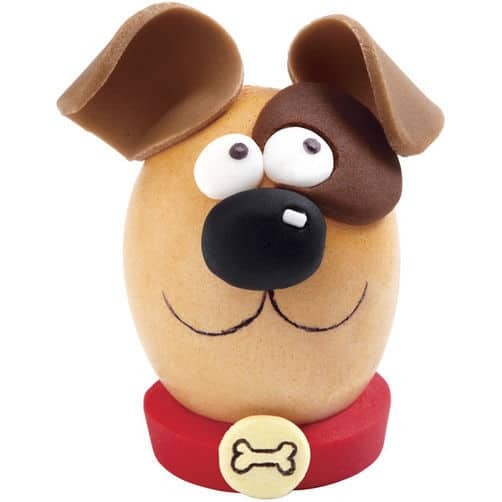 That’s right – Perky Pup Easter Eggs! Kids (and grown-ups, too) will have a blast making these adorable eggs for Easter. You’ll need hard-boiled eggs, orange egg dye, Wilton White Ready-To-Use Rolled Fondant, gel food coloring in shades of light brown, dark brown, black, and red, Fine Tip Primary Colors FoodWriter® Edible Color Markers, and piping gel to use as glue to make facial features. (Optional supplies: Yellow Skittles or M&M’s to use as the dog tag. Color eggs orange. Let set and dry completely. Tint 1/2 oz. of fondant light brown, 1/2 oz. dark brown, and 1/2 oz. red. Tint 1/4 oz. black; reserve 1/4 oz. white. Roll out red fondant 1/4 in. thick. Use knife to cut a strip, 3/8 in. wide x 4 1/2 in. long. Wrap into a circle, securing ends with damp brush. Attach egg with piping gel. This is your egg-dog’s collar. Roll out light brown fondant 1/16 in. thick. Use medium Cut-Out to cut two oval ears. Attach to top of egg with piping gel, bending over for a floppy look. Feel free to get creative with ear lengths, shapes, and colors – you can even model them after your own dog’s ears. Roll out dark brown fondant 1/16 in. thick. Cut out a small circle for the eye spot. (Tip: If you aren’t comfortable cutting a small circle, simply ball a piece of dark brown fondant between your hands and then flatten) Attach spot to egg with piping gel. Roll out white fondant 1/16 in. thick. Cut two smaller circles for eyes. Attach to egg with piping gel. From black fondant, shape an oval 1/2 in. high x 5/8 in. wide x 3/8 in. thick. Attach for nose with piping gel. Roll a small white ball and attach with piping gel for nose highlight. Use black FoodWriter edible color marker to draw a bone onto a yellow Skittle or M&M. Attach to collar with piping gel. This is your egg-dog’s ID tag! Use black FoodWriter edible color marker to draw mouth and pupils.